Finally, a Godley & Creme album that doesn’t feel like a Q-tip being poked into your brain. After a steady diet of defiant and restless art pop, the pair return to their roots (i.e., 10cc) with clever narratives and throwbacks to ‘50s music. 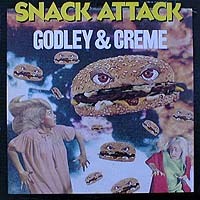 Snack Attack (released in the UK as Ismism) actually generated two UK Top 10 singles: “Wedding Bells” and “Under Your Thumb.” Drawing its inspiration from doo-wop, “Wedding Bells” rekindles the pair’s love affair with ’50s music, as does “Sale of the Century.” However, they’re the only two tracks that haven’t been rigged with some sort of booby trap. “Under Your Thumb,” “Joey’s Camel” and “Lonnie” are dark narratives, not unlike the old pulp fiction short stories you’d find in the ‘50s and ‘60s. The remaining songs defy easy categorization: “The Problem” is a mock math/logic problem set to music, “The Party” is a rap disguised as party chatter, “Snack Attack” is a libidinous litany of foods delivered from a delirious dieter, “Ready For Ralph” is about absolutely nothing. If it sounds like the pair is up to the usual tricks, they are, the difference being the music. The short attention span that sabotaged earlier songs has been sublimated this time, with the lyrics getting the lion’s share of attention and the music pushed to the background, perhaps castrated but awfully catchy. It’s almost a light version of art rock/funk (think Robert Fripp’s League of Gentleman on a much milder scale), silly yet somehow thought provoking. If that sounds like a description of 10cc, you’re getting warm. It’s more like 10cc distilled to half its essence, but by focusing on what they do well (which wasn’t sprawling art rock), Godley & Creme deliver an album that 10cc fans can finally enjoy. No longer running away from their legacy, the pair embraces their past with a perfect match of pop music and smartaleckiness. All songs written and arranged by Godley & Creme. Lol Creme, Kevin Godley with Bimbo Acock (all saxophones). Produced by Godley & Creme; engineered by Lol Creme; mixed by Nigel Grey (Gray). Front cover illustration by Lou Beach. Art direction by Bob Defrin. Released as Ismism on elpee and cassette in October 1981 in the UK (Polydor, POLD 5043), Canada (Polydor, PD/PDS4-1-6328), Germany (Polydor, 2383 618), Japan (Polydor, 28MM-0080) and the Netherlands (Polydor, 2442 193); reached #29 on the UK charts. Re-packaged as Snack Attack on elpee in 1982 in the US (Mirage, WTG 19341). Re-issued on compact disc in 1991 in Japan (Polydor, POCP-2079). Re-packaged with Freeze Frame on expanded compact disc on May 24, 2004 in the UK (Edsel) with bonus tracks. Re-released on 24-bit remastered, expanded compact disc on June 28, 2006 in Japan (Polydor, UICY-93085) with 3 bonus tracks. Re-released on super high material compact disc in 2010 in Japan (Polydor, UICY-94542) with 3 bonus tracks.